A parallel linkage that bolts on 4x, 5x, or 7x bars (i.e. 4×4, 4×6, 5×5, 5×7, 7×7) to a 2 1/4 diamond toolbar. Also available is a parallel linkage to a 4×4 bar. Northside Welding offers replacement heavy-duty ripper points. This particular point type has a wing which helps with ground shattering. The shark fin on the point helps to eliminate ribboning in front of the shank. Also available is a shark fin point without the wing. 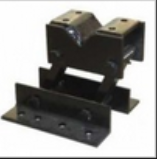 Northside Welding has different sizes of stationary bar spacers available. Space from a square tube to a solid diamond bar, tube to tube, or solid diamond bar to solid diamond bar. Northside Welding offers replacement end plates for roller harrows. Northside Welding offers two different types of sled corrugators to suit your needs. Northside Welding offers two different styles of wheel line brakes. Shown here is the standard “sheep hook”.